8.81 points at 84 votes (rank 4). This classic game is about a diamond chase underground with many obstacles. Try - as Rockford - to collect all required diamonds in a total of 16 caves (A-P) each with 5 difficulty levels, and find the exit in the time given. After every 4 caves (D, H, L, P) follows a so-called "intermission", a logical puzzle (without its own "cave letter"). Rockford can dig through the ground and push rocks. But these can also be dangerous. If he stands directly below a rock, Rockford can hold it on his head. But if a rock falls on his head, it will cost him a life. Rocks will not stay on each other or on walls. If Rockford digs away the supporting soil, rocks will start to slide. Furthermore, there are some not-so-friendly animals such as fireflies, amoeba and other things you'd better not touch. Butterflies and other inhabitants of the underground can only be defeated by letting rocks fall on them. When defeated, they turn into diamonds, which Rockford can pick up. 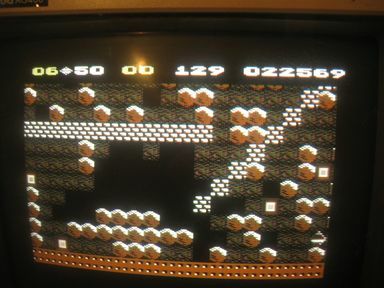 As soon as the necessary amount of jewels has been collected (the number is shown in the upper bar), the escape tunnel opens into the next level. Strategy and thoughtful planning is the basis to master this game. 2D-screen, which scrolls in all directions. Simple illustration of the character, boulders and other things. Realistic design of triggered avalanches. Sound and music are kept simple. After every scene the current score and the highscore is shown. F3 = change number of players (either 1 or 2 players, after each other) and choose control options (1/2 joysticks). Every player has 3 lives. Extra-lives are granted every 500 points. The tunnels Rockford has dug, then glisten briefly. There are 16 caves, which are marked A to P. Every cave can be played in 5 difficulty grades. A - Intro: Pick up Jewels and exit before time is up. B - Rooms: Pick up Jewels, but you must move boulders to get all Jewels. C - Maze: Pick up Jewels. You must get every Jewel to exit. D - Butterflies: Drop boulders on Butterflies to create Jewels. E - Guard: The Jewels are there for the grabbing, but they are guarded by the deadly Fireflies. F - Firefly Dens: Each Firefly is guarding a Jewel. G - Amoeba: Surround the Amoeba with boulders so it can't grow any more. Pick up Jewels that are created when it suffocates. H - Enchanted Wall: Activate the Enchanted Wall and create as many Jewels as you can. I - Greed: You have to get a lot of Jewels here. Lucky there are so many. J - Tracks: Get the Jewels and avoid the Fireflies. K - Crowd: You must move a lot of boulders around in some tight spaces. L - Walls: You must blast through walls to get at some of the Jewels. Drop a boulder on a Firefly at the right time and place to do this. M - Apocalypse: Bring the Butterflies and Amoeba together and watch the Jewels fly. N - Zigzag: Magically transform the Butterflies into Jewels, but don't waste any boulders and watch out for the Fireflies. O - Funnel: There is an Enchanted Wall at the bottom of the rock funnel. P - Enchanted Boxes: The top of each square room is an Enchanted Wall, but you'll have to blast your way inside..
Sledgie: "It is a classic of its kind, collecting jewels and avoiding boulders. After 1984 until today various successing version have been issued. Big motivation to play through all the levels. Rather easy graphics and colour design. I think the background music and sounds are very good. My personal voting is 10 out of 10." Guybrush: "As primtive as the game principle was, as great was it. Very addictive. 8 out of 10." Darkstar: "THE classic per se. However, at that time I somehow liked Crystal Fever even more..."
Shakermaker303: "Best of the best. Just THE ultimative addictive game - virtually diamond fever. Game idea, playability and fun are in my opinion very important. For me once more the proof that a good game doesn't need too complicated ingredients and hyper-graphics. I especially liked the construction-kit, where you could create your own caves and define own intermissions. I had designed over 150 caves at that time and my friend and I played the caves in turns "to each other". My conclusion: Rockford forever - I give all 10 out of 10 points. You need to have played and seen it." Blubarju: "Yes,... good old Rockford and his greed for pressed carbon . The game is a very successful mixture of puzzle and skill game, that today is as much fun as it was in those times, 9 diamonds... er points for it." Flodder: "There is a reason why this game was ported to most of the computer systems at that time, and it was a model for more or less good copies. Ingeniously simple game principle, enormously addictive and simple but nevertheless coherent sound and graphic effects which could be done by almost every computer at that time. A milestone in the history of computer games. 9 out of 10 !" Since 19.09.2008 the game is available for download for the Nintendo Wii Virtual Console. It uses the BD1-Engine' with these elements: spaces, dirt, walls, magic walls, steel walls, boulders, diamonds, amoeba, firefly, butterfly and of course the exit. The game was 16 kbyte big, uncompressed. 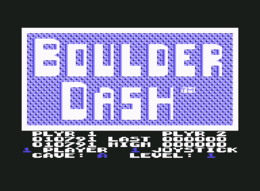 Boulder Dash 2: It uses the BD2-Engine': known bugs were fixed. The new elements slime and growing walls were added. In contrary to the BD1-Engine the amoeba doesn't stop when you let fall a boulder into the magic wall, which is related to the omission of the strange magic-wall-timing. Boulder Dash 3: This game was constructed by a different team of programmers. It uses the dated BD1-Engine again, although with new graphics. The caves have some construction bugs which makes it impossible to play level 4 and 5 to the end, and levels 2 and 3 are designed very unfair. Furthermore many animation bits are wrong, that's why the monoliths (new name for the amoeba) are not animated in most of the caves. Boulder Dash Construction Kit (aka. Boulder Dash 4): Here it is all about the PLCK-Engine. New elements were hidden exits and voodoo Rockfords. It is possible to set the timers for magic wall and amoeba independently from each other for the first time. The 5 levels don't exist any more, because the format of the caves has changed in favor of a total of 48 caves possible in the game. However, the possibility to build own games is tainted with defects: a serious bug causes the game to crash during the dissolve effect. 15 caves are included on the medium as Boulder Dash 4. Also often seen as a handicap is the fact, that games build with this kit, cannot be played without the game module. So you need to own the construction kit to play fan games. Even before the construction kit had been released, the first fan-made versions existed. Dr. Watson had built his own Boulder Dash 4 and Don Pedro continued the series with parts 5-11. No One and The Blockheads started their own series. All these versions use the BD1-Engine. Furthermore there are two Finalboulder games, whereby these are remixed versions of older games. There was no editor for this engine, and so everything had to be built directly in the memory with a primitive monitor. 1987: The Construction Set+ by The Softkillers is a level packer, which made you able to build standalone games. The old cause for crashes in the game module was not corrected though. This editor featured editing of the graphics and importing of character sets for the first time. This slightly modified game module is called Soft-Engine for short. 1987: Lord Diego developed the effects and also upgraded the construction kit to the effect kit. Then he patched his effects into the Soft-Engine. This way, explosions can create boulders, or falling diamonds dissolve into thin air. Furthermore it is now possible to place several Rockfords, which you then have to steer simultaneously, multiple exits, as well as amoeba and slime in the same cave. Also the border is now editable. from 1987: A number of Boulder Dash clubs like Boulder Dash Club Freudenberg or POSOCOPI Waldkirch were founded, where people thought about those "problems". A No One Packer was developed which was not released. That modified game module it uses is called No1-Engine for short. With this tool, an intro text could be placed before the start of the game. For the No One Packer there is a character set and a graphics editor, so that also many different game graphics emerged. As the BD2 dirt mod for the BD2 amoeba graphics was also integrated into the engine, changed dirt graphics were not possible any more. To evaluate the cave design during construction, there was also a BD2 dirt mod patched construction kit. The dissolve animation was removed, because it was detected as the alleged cause for the crashes. Games built with this version have a highscore table which can be saved to disk for the first time. 1988: Prof. Knibble wrote the Knibble-Packer. In his packer he used the No One highscore routine at first. This version is known as the Knib-Engine for short. No One refined his own level packer in the meantime and finally released it. Now up to 48 caves could be packed instead of those mandatory 20. The intro was animated and appears with the title music. The last common version is v5.3 (there are a few games with different numbers, whereby these are probably typos or beta versions, which were not wide spread). Lord Diego released his last effect kit, where you could also choose the size of the amoeba now. The effect settings are now saved with the cave. For this there was a patched No One Packer v5.3, which reads the new format, so it is possible to set the effects individually for every cave. 1989: Prof. Knibble had by now developed version 3 of the Knib-Engine, which contains a new highscore routine. An own level packer for the engine was not programmed. In 1990 Prof. Knibble wrote in cooperation with POSOCOPI a new engine, the NewB-Engine aka. 1stB-Engine. POSOCOPI brought in the caves for the first First Boulder games. The announced level packer was not released though. So at first the 3 First Boulder games by POSOCOPI remained the only ones. The 1stB-Engine contains the new elements: sweet, keys, doors, biters, walls that look like boulders or diamonds, clocks, Mrs. Rockfords, bombs, bladder spenders, mutant stones, ghosts, bladders and switches for the firefly and butterfly direction, and for the direction of the growing wall and the biter's delay. For these additions, a new cave format was necessary in order to handle all those new things. LogicDeLuxe built the level packer v2 in the meantime, with which you could walk diagonally. A patched construction kit was required for this. This level packer also used the No One highscore routine. 1991: Since the No One Packer was not in development any more, LogicDeLuxe wrote the De Luxe Packer 1.3. The cave dissolve animation was back and the true cause for the crashes was fixed. The cave selector also works backwards now, and the magic walls is now ringing, as it was actually intended, but never working in the original construction kit and in all other level packers until now. 1992: As there still was no editor for the 1stB-Engine, the first Marek's de Luxe Construction Kit by LogicDeLuxe was developed. The possibility for walking diagonally was built into the 1stB-Engine while at it. Several versions of this editor were published on the -=ROCKFORD-FD=-. 1998: With the spreading of the internet several fan homepages were created where you can download collections of fan-made Boulder Dash games. 2001: Some fans were disturbed by the fact that No One had changed the sound of Rockford's walking. Version 1.31 of the de Luxe Packer restored the original walking sound. Then there was always the desire to change the dirt graphics or let the game appear in the original graphics. These were then integrated in version 1.41. The BD2 dirt mod is now optional. 2002: With the Crazy Light Engine (CrLi) the less useful ghosts were replaced with boxes, acid and falling walls. Furthermore some bugs from earlier engines were removed. With the Crazy Light Construction Kit (CLCK) corresponding caves can be built. 2006: The Crazy Light Tools are available in a version, in which it is possible to build standalone games. 2008: In this new version of the old PLCK engine, effect caves by Lord Diego's effect kit 3.x and normal caves of the official Construction Kit can be mixed for the first time. Moreover it contains a few bug-fixes and optimizations. 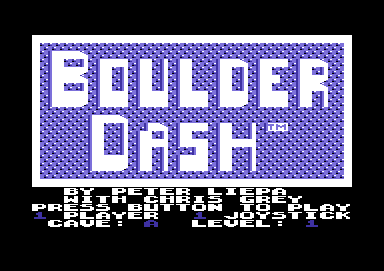 In March 2008 a Boulder Dash version for the C64DTV was published, that brings improved graphics (256 colours) as well as 340 caves. 2009: In 2009 the series "The Lost Caves" was started. While the first part was based on only a few caves designed back in 1987, the six other parts (TLC2 to TLC7) are much larger. Schlonkel has announced the continuation of the project for September 2013 with "The Lost Caves 8". At the "C64 Power Game Mod Compo" (30th June 2012) three new dashs were published: "Brain Delicacy" by Dr Guru is a level set which exclusively consists of puzzle/logic caves. "Power Dash" stands out due to the fact, that the caves were built by 10 different designers. "Crazy Dream 10" by LogicDeluxe is the first game, that was created with the XDC. The XDC - currently in development stage - is a cross platform development kit programmed by LogicDeluxe, which has a PC game editor with which you can construct dashs for the C64 (respectively also for Atari). Furthermore, the XDC engine also offers numerous new features, e.g. the use of two independent amoebae in one level. 20.01.1992: AlexZOP founds the Boulder-Dash-Forever-Fan-Club and circulates a disk named Boulder Dash For Ever A for the Commodore C64 homecomputer. This disk is followed by the Boulder-Dash-For-Ever-Fan-Club B disk at the end of 1992. 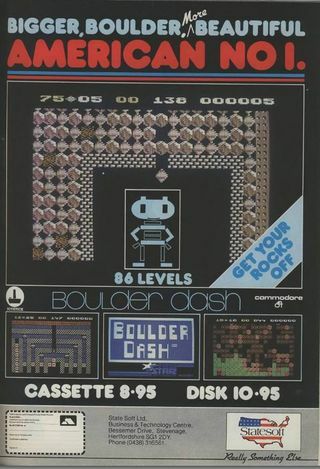 On both disks there is a call to take part and create worlds for the C64 game Boulder Dash Construction Kit, as well as freely distributable software. 01.04.1993: Due to the positive feedback of the previous disks, AlexZOP starts the publishing with the edition 000 of a freeware and software disk series for C64, C128 and VC20. The model of this -=ROCKFORD-PD=- or -=ROF-PD=- series is the AmigaLibDisk disk series by Fred Fish. Furthermore AlexZOP started the disk magazine -=ROCKFORD-MAG=- and publishes it in irregular intervals up to edition 10 of the disk series. The content of this disk series are chosen and subsequently documented, freely distributable software for the aforementioned Commodore homecomputer , the -=ROCKFORD-MAG=- and the material from and for C64 Boulder Dash players. AlexZOP wants to establish a freeware scene at the C64, whose scene at that time is mainly dominated by copyright pirates. The most popular program of the -=ROCKFORD-PD=- series is the Marek's de Luxe Construction Kit, which was programmed by Marek Roth (LogicDeLuxe) and which will appear in the following years in several improved versions exclusively in the -=ROF-FD=- series. 26.05.1993: AlexZOP renames the series to -=ROCKFORD-FD=- or -=ROF-FD=- starting from edition 002. In the following years he also publishes early editions in newer versions with this name. Under this name the series is released until edition 40, whereby many editions contain two to more disks. 01.04.1994 On the double edition 012 & 013 an edition of -=ROCKFORD-MAG=- in pure ASCII text and content from online sources is released for the first time. 01.06.1994 With edition 017 the first BOULDER-DASH-FOREVER-FANCLUB-MEGA-DISK-NO 1 is released which contains solely Boulder Dash material of the club members. On 15.09.1994 the disk is released in an improved version 17A. 10.10.1994 Edition 019.1 V1 is released, one of the most popular edition of the series. It contained Notemaker programs. This disk is so successful that AlexZOP needs to employ people to manage to make all the manual copies that are needed. For the first time 3 C64 with each 4 disk drives are in use. On 04.08.1995 an improved edition 019.1 V2 is released. 01.01.1995 - 07.01.1996 For the first time are media for the C64 & C128 containing .GIF graphics with the edition 028.1-9 released. Edition 028.10 stays incomplete and unreleased so far. 20.03.1995 For the C64 image editing program GoDOT Amiga IFF graphics are released on edition 032.1-4. 18.04.1995 With editions 033.1 to 2 10 disk sides are released which are celebrated by the technical and scene press and count as the high points of this series. They contain sensational software for the VC20 homecomputer by Commodore. 01.09.1995 With edition 034 the BOULDER-DASH-FOREVER-FANCLUB-MEGA-DISK-NO 2 is published which offers exclusively Boulder Dash material by the club members. It contains software as Boulder-Dash Packer V5.3 De Luxe, Deluxe Packer V1.3, Softkiller BD-Construction Set V1.4 as well as the Knibbleditor V2.2 and the Enemiedesigner V2.3. On 19.11.1995 the disk is released in an improved version 17A. 27.08.1996 With editions 040.1-5 the series is released for the last time under the name -=ROCKFORD-FD=-. It contains the packed -=ROCKFORD-MAG=- 10, which make 18 disk sides ASCII text. With this it is the most comprehensive disk magazine of the C64 history. 01.02.1998 After a creative pause AlexZOP renames the series to -=C64 GALAXY LIBRARY=- or -=CGL=-. The magazine changes to -=C64 GALAXY MAG=- and the BDFFC gets the -=C64 GALAXY GANG=-. 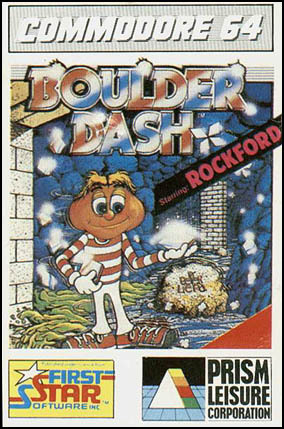 The reason is a dissuasion by First Star Software due to their trademark rights for the names Boulder Dash and ROCKFORD. As the first edition under the name -=CGL=- number 041 is released. 01.01.2000 With number 078 for the first time a -=CGL=- edition is exclusively released as .D64 file on a x86-DOS formatted disk to be used in C64 emulators under the -=ULTIMATE DOS=- system, a PC/GEOS & x86-DOS distribution, free copiable software, released by AlexZOP. The series is accompanied through the years by several editions of an info disk with the full directory and further information. Boulder Dash in the Killer List Of Videogames. This page was last modified on 27 August 2018, at 19:23.